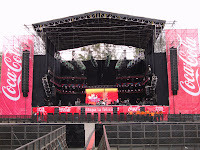 In one of Venezuela’s largest annual live music events, rental sound company Grupo Zonico provided an extensive audio system for Coca-Cola Solid Fest 2010 at Hipdromo La Rinconada in Caracas. JBL VERTEC® line arrays comprised the main PA system for the 4-day event, which included performances by leading international and local artists for crowds averaging 20,000 persons per day. With separate themed event days presenting rock, urban and Latin artists, performers at the festival included Korn, OscarD Leon and Luis Fonsi. Grupo Zonico deployed a main PA system featuring two array hangs, each comprising 15 VERTEC VT4889-1 full-size line array elements and three VT4887ADP compact powered line array elements with DrivePack® technology. The system also included 26 VT4880A full-size arrayable subwoofers, with an additional 12 VT4887ADP loudspeakers provided for front fill. Crown I-Tech HD12000 and HD9000 amplifiers powered the main suspended arrays, while I-Tech 8000 amplifiers powered the subwoofers. Grupo Zonico also set up a supplemental tower featuring 12 VERTEC VT4888DP midsize powered line array elements. The overall system was configured and remotely controlled and monitored with Harman HiQnet™ System Architect™ software. “The system sounded amazing and JBL’s V4 signal processing was incredible,” offered Jose Lehardy, FOH Sound Engineer for Gilberto Santarrosa. “The system sounded very clear with crisp vocals and lots of headroom,” said Pedro Collado, FOH Sound Engineer for Lusi Fonsi. Guillermo Sanchez, Business Development Manager, Latin America, Crown Audio, noted that the system’s performance and reliability allowed Grupo Zonico to focus on its main task: pleasing the artists and engineers. “The power and vocal clarity outperforms any other system available in the market and the benefit that Grupo Zonico is receiving from JBL VERTEC line arrays with Crown I-Tech HD amplification is priceless,” he said. “As Solid Fest is a festival with so many international performers in such a short time, it is usually difficult to please everybody as there are so many different music styles, but as a high-profile company, we strive to provide the highest standard in the audio Industry in Venezuela. That is ultimately why we have chosen Harman as our equipment supplier,” said Sheila Perestrelo, Director of Marketing and Public Relations, Grupo Zonico. Effective immediately, Studer Professional Audio GmbH has appointed Tibor Tamas as the new Sales Engineer for Germany, Austria, Greece and the Eastern European countries. Tibor Tamas is a Studer veteran having worked for the company for over 32 years. He started in 1977 as an apprentice to continue his education as an Electronics Engineer with Studer and worked in the R&D department developing Mixing Consoles. Subsequently Tibor joined the service department providing worldwide Product Support/Engineering and more recently spent 4 ½ years in North America, firstly at Studer Canada then JBL – Studer’s Distributor in the USA - as a Sales Engineer and Technical Service Manager for Studer. As one of the most successful musicians in Latin America, Alejandro Sanz has built a name for himself as a dynamic and exciting performer; selling over 25 million albums worldwide and winning 17 total GRAMMYs; two of which are attributed to the U.S. Grammy’s and the other 15 at the Latin Grammys. With his new project Paraiso Express on the verge of release, Sanz recently embarked on his worldwide “Paradise” tour, showcasing the anticipated album with a set of AKG equipment that included the DMS 700, an IVM 4 in-ear system and a variety of D7 and D5 microphones. With such a wide variety of styles influencing his music, Sanz requires an audio system that is both versatile and dependable, which is why Spanish distributor Neotecnica supplied the tour with the AKG equipment. Each and every concert will be using 24 different DMS 700 channels for voices and instruments and will also use 16 channels of the IVM4 in ear-system. For vocals, the DMT 700 will be equipped with D7 and D5 handheld capsules that prove to be the best solution for adapting to Sanz’ vocal style. Sanz will begin this extensive 2010 world tour in the most important locations of Latin America, Spain and the U.S., presenting his new album Paraíso Express and also showcasing some of his most important and emblematic songs. International Helitours has been showing tourists an unseen side of Florida for more than 16 years, flying over an exciting array of theme park attractions, world-class golf courses and Florida’s most unique natural attraction, the Everglades. Now, with the Mitsubishi CP-9800DW photographic printer provided by Computing Designs, Inc., the company has added a new dynamic to its helitour business in offering on-site, high-quality photos, fast. As Mitsubishi’s most reliable and robust photographic printer, the CP-9800DW is perfectly suited to handle all of the printing needs for a company like International Helitours. It comes complete with a 300 dpi thermal head that allows it to print high-quality images time after time, and incorporates a roll-type mechanism for fast, jam-free reliability. What’s more, the CP-9800DW offers four different output sizes with edge-to-edge printing. This combination of industry-leading features proved to be the deciding factor in International Helitor’s decision to purchase the printer. International Helitours has been using the Mitsubishi CP-9800DW for almost a year now. They take up to 100 pictures before, during and after the actual helitour, and then bring the customer into the office to review them on a computer. After the customer has selected their desired photos, International Helitours is able to use the CP-9800DW to print and sell the pictures right then and there, with no waiting. Headquartered in Irvine, Calif., Mitsubishi Digital Electronics America, Inc. is a national leader in premium quality imaging and presentation products that set the standard in innovation, performance and reliability. Mitsubishi Digital Electronics America’s Imaging Products Division has more than two decades of manufacturing experience and technology leadership. Every Mitsubishi printer, photo kiosk and digital video recorder is backed by a network of dedicated professionals and an outstanding service and support program. Mitsubishi's products are available to customers through a network of authorized dealers and distributors throughout North America. 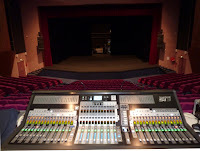 Soundcraft’s Spanish distributor, Earpro, has underlined the continuing success of the manufacturer’s Vi series digital desks, with the recent installation of a Vi4 at El Teatro Campoamor in Oviedo. They are equally excited about the recent launch of the new Vi2 — offering a Vi series desk in just 85cm of real estate. The aim of the Capellia Cultural Centre is to enable the town of La Chapelle-sur-Erdre to work every day to promote artistic and cultural education for all, allowing people of all generations to take, renew and revive their talents in harmony with each other. To achieve this, the Cultural Centre’s entertainments team creates demanding programmes and spectacles in a number of disciplines — song, dance, circus, choreography, comedy, music and theatre (including for young audiences). “When I discovered the Soundcraft console I immediately saw all these unparalleled advantages afforded by its incomparable ergonomics … such as display parameters in either Global or Channel mode, allowing access to all the section parameters horizontally, without needing to refer to a central screen." Thanks to the spectacular encoder and OLED displays, the Soundcraft Si3 offers unparalleled comfort and ease of use. By integrating all the processing electronics and I/O’s in a single frame, it simply replaces any standard analogue console without necessitating any modifications in the cabling and installation. The Soundcraft SI3 was installed by the company DBAM which also has a Soundcraft Vi6 digital console in its rental fleet. In recognition of more than 60 years contribution to the art and science of music recording and performance, storied microphone and headphone innovator AKG was recently awarded a prestigious technical Grammy® award from the National Academy of Recording Arts & Sciences (NARAS). The award, which was presented at Grammy Week in Los Angeles, represents an historic first in AKG’s history of firsts — not simply in terms of technology innovations, but also in great recordings and performances. From The Beatles’ watershed performances in Shea Stadium in 1967 to Aerosmith, the Rolling Stones, Frank Sinatra, and today’s most progressive and successful artists like Jay Z, Missy Elliot and Kayne West, AKG microphones and headphones have provided great sounding technologies to support the most demanding and creative projects. AKG is in good company, with this year's only other GRAMMY Technical Award to be presented posthumously to Thomas Edison, inventor of the phonograph, early motion picture technologies, and the incandescent light bulb. Harman's JBL brand also earned a GRAMMY Technical Award in 2005, the first and only loudspeaker manufacturer to be so honored. Founded in 1947, AKG has been providing state-of-the-art microphones and headphones for a variety of live and recording applications. "This year's honorees are a prestigious group of diverse and prominent creators who have contributed some of the most distinguished and influential recordings," said Recording Academy President/CEO Neil Portnow. "Their outstanding accomplishments and passion for their craft have created a timeless legacy that has positively affected multiple generations, and will continue to influence generations to come. It is an honor and privilege to recognize such talented individuals who have had, and will continue to have, such an influence in both our culture and the music industry." Echoing this sentiment, AKG President, Stefan Gubi noted, “Great sound does indeed start with the microphone and, I believe, especially with AKG microphones. The music world has changed considerably since AKG’s inception more than 60 years ago, but the dedication of AKG’s engineering and manufacturing teams and the preeminence of AKG microphones and headphones has been a constant. We are extremely pleased to receive this great honor and we are grateful to NARAS for this recognition. This year, AKG continued it’s tradition of innovation; introducing some of their most advanced microphones and headphones to date. With the release of the C 414 XLS and XL II, AKG introduced two of the most sensitive and versatile microphones available; with the Perception 120 USB, AKG gave users the ability to record studio-quality sound from their desktop and with the DMS 700, AKG presented their first digital wireless audio system. Starting in March of 2010, in addition to great sound and reliable performance of AKG’s wireless systems, users will have a new tool to browse, monitor, and control their wireless microphone and IEM systems: their iPhone®. With the introduction of their new iPhone application - which will be available for free in Apple’s iTunes® store – AKG has effectively streamlined the workflow for wireless microphone monitoring and configuration by linking Harman’s HiQnet® protocol to the iPhone and iPod® Touch app via Wi-Fi® network. The new application can be used to monitor wireless system parameters and radio frequency connections on stage for some of AKG’s most popular wireless microphone systems, including the DMS 700, the WMS 4000/4500, and the IVM 4 in ear monitoring system. The user can easily browse through the entire wireless system within the device list, monitor each device and it’s parameters separately within the stripe view, or use the RF monitor for checking the radio frequency connection of each wireless device. The iPhone application is connected via Wi-Fi to a wireless router, which is connected to the AKG HUB 4000 Q. The application can be used side by side with Harman Pro System Architect® because the entire system is based on Harman’s advanced HiQnet® protocol. Selected for the ability to meet the requirements of the most demanding professional applications, JBL loudspeakers were used in both the arena and the critical listening room of the 52nd Annual GRAMMY® Awards telecast on Sunday, January 31 at the STAPLES Center in Los Angeles, CA. As has been the case for the past several years, JBL LSR Series studio monitors, VERTEC ® line arrays and VRX portable line arrays were crucial to the success of this year’s telecast. The star-studded production for this 52nd Annual GRAMMY Awards featured a host of live entertainers and celebrity presenters. Beyoncé was the biggest star of the evening, taking home six GRAMMY Awards, including Song Of The Year for “Single Ladies (Put A Ring On It).” Taylor Swift was also a big winner, earning Record Of The Year honors for “Fearless,” along with three other GRAMMYs. 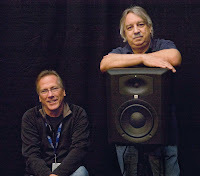 In addition, audio systems provider ATK/Audiotek supplied the main live audio system at the GRAMMY Awards, deploying a total of 70 JBL VERTEC VT4889 full-size line array elements, with 48 deployed as main left/center/right suspended arrays and the rest as signal-delayed arrays farther back in the venue. ATK/Audiotek also suspended twin 6-box subwoofer clusters overhead, using JBL’s VT4880A ultra-long excursion arrayable subwoofer. Also in use were 16 JBL VT4887 compact line array elements for auxiliary fill arrays, and 12 JBL VRX932LA compact constant-curvature speaker boxes for VIP front fill positions. With a variety of Olympic athletes signed to its marketing agency, Arluck Promotions has been touring the country for the last year on the Swim Champions Fitter & Faster Tour™: a 50-city tour of the United States that puts its clients in the pool with swimmers of all ages. At every stop, Arluck Promotions has inspired young swimmers to live active lives, and the company uses the Mitsubishi CP-3800DW photographic printer to provide on-site photos for the tour attendees. Before purchasing the Mitsubishi CP-3800DW, Arluck Promotions was forced to use a local convenience store for picture development. Not only was the process time consuming and costly, but it also resulted in a number of development problems that caused the staff to search for new options. What Arluck Promotions found was the CP-3800DW: Mitsubishi’s printer that combines high resolution and high-speed printing with an innovative, space-saving design. In addition to the speed of delivery, Arluck Promotions selected the Mitsubishi printer for its versatility and durability. The CP-3800DW incorporates a unique roll-type mechanism for jam-free reliability, and it provides bright, bold colors along with a level of accuracy that leaves it suited to handle a wide range of photo processing applications. Headquartered in Miami Beach, Florida, Arluck Promotions, Inc. is a sports marketing agency that develops campaigns and properties featuring Olympians that connect companies with their target markets. Arluck Promotions’ signature event is the Swim Champions’ Fitter & Faster Tour. The company also specializes in integrated marketing & media campaign development; event development and execution; developing spokesperson and endorsement programs; and athlete and celebrity management. Atlantic Pro Audio is a versatile A/V company based in Altamonte Springs, Florida with a wide variety of clients and strict requirements for its audio equipment. Offering services for corporate events, theatrical productions and music festivals, Atlantic Pro Audio needs a versatile system that is easy to use, affordable and able to handle complex audio setups with extensive I/O; and with the Soundcraft Si3 digital mixing console, that’s exactly what they got. The Soundcraft Si3 is designed for live use on both touring sound systems and fixed installations, which made it the perfect fit for Atlantic Pro Audio. With 64 Mic inputs, four stereo Line inputs, and 24 Aux/bus, eight Matrix and LCR outputs, Atlantic Pro Audio was easily able to use the Si3 at a number of concerts and corporate events featuring national acts. The company is continuously hearing back from satisfied users about the excellent Mic Pre’s, high audio quality and ease of use. “We’re able to hook up the console, take 10 minutes to show guest engineers some tips and tricks and hand it over,” said Craig Beyrooti, Owner of Atlantic Pro Audio. The Si3’s ease of use was recently demonstrated when the company sponsored a church production of “Jesus Christ Superstar Junior” that featured 16 wireless lavs, 8 area microphones and computer playback. According to Beyrooti, he was able to dial in the board and leave the mixing for the entire show to his 14-year-old son as this production featured actors and technicians from the youth of the church. The 12 DCA’s are a huge help to mix engineers and this certainly was the case this time around. Nowhere was the console’s versatility more evident than at St Mary Magdalen Church’s fall festival: a 3-day and 2-night concert that took place last year. There, several engineers and volunteers took turns mixing for a variety of performances that included single dance groups, CD playbacks, one-man acts and full rock bands. Not only were there multiple engineers mixing on the console, but the performance requirements were different from day to day and act to act. The huge I/O capability meant that no re-patching was required as all the inputs from each act, for each day, had dedicated channels. The split channel layout of the console also enabled two engineers to EQ and tweak at the same time and thus dial everything in that much quicker. In addition to the Si3, it also uses some JBL loudspeakers, Crown Amplifiers and AKG microphones, which allows it to easily integrate all of its audio systems. JBL’s performance speaks for itself, which is why the Facilities Director of the National Corvette Museum in Bowling Green, Kentucky selected JBL loudspeakers for an upgrade to the Museum’s Chevrolet Theater after hearing them at his community church. Exceptional Sound LLC designed and installed the new system, providing the Chevrolet Theater with a 5.1 surround sound system complete with nine JBL loudspeakers. Exceptional Sound, LLC has been using JBL loudspeakers for years and is familiar with the sonic integrity for which JBL is known. The company’s past experience led it to select a series of two AM6200/64 and one AL6115 loudspeaker, with four AM6215’s for front LR and rear LR and two ASB6128 subwoofers under the stage. 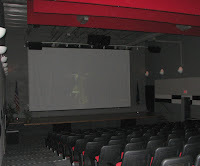 The 5-day installation provided the Chevrolet Theater with a flawless surround sound system. The Museum was so pleased that it called Exceptional Sound back for another system in its new conference center. Philpott and his team again turned to JBL for the installation, ultimately choosing two AM4215 main speakers, two MRX512M monitors, 10 Control 25 AV surface mount loudspeakers for delay and an ASB6118 subwoofer for full, even sound throughout the space.